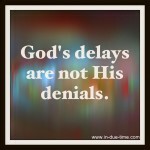 Psalm 40:1-4 – I waited patiently for the Lord; he turned to me and heard my cry. He lifted me out of the slimy put, out of the mud and mire; he set my feet on a rock and gave me a firm place to stand. He put a new song in my mouth, a hymn of praise to our God. Many will see and fear and put their trust in the Lord. Blessed is the man who makes the Lord his trust, who does not look to the proud, to those who turn aside to false gods. Waiting. That seems to be the common theme of how we feel lately. Waiting on God’s healing of our bodies. Waiting for it be January 2012 so C.J will be back in TX. Waiting to see what God has for us in the future. Waiting to find out when will become parents. I listened to a sermon today called Waiting Room that I will write more about later, but as I was reading tonight I came across this passage of David’s wait. As David cried out to the Lord and waited patiently he saw four benefits. Often blessings cannot be received unless we go through the trial of waiting. Psalm 40:7-10 – Then I said, “Here I am, I have come-it is written about me in the scroll. I desire to do your will, O my God; your law is within my heart.” I proclaim righteousness in the great assembly; I do not seal my lips, as you know, O Lord. I do not hide your righteousness in my heart I speak of your faithfulness and salvation. I do not conceal your love and your truth from the great assembly. In the prior verses, there is a desire to do God’s will, serve and obey Him. David promises to speak of God’s faithfulness and salvation around him. We have talked a lot about how to use this time wisely as we begin our long distance relationship and extend our waiting time even further. Our hope is to continue to cry out to God, sing His praises and speak of His faithfulness and salvation around us. And, after the waiting room door is closed, we hope to be rejoicing in all His blessings and continuing to share His good name.